Last week, sweetgreen announced that construction had begun on their fourth location in the city. 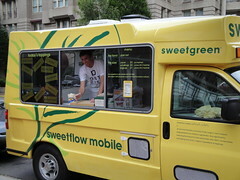 With bustling Bethesda, Georgetown and Dupont stores, in addition to a successful sweetflow mobile truck, the new 15th and P Street endeavor is off to a running start. The former Georgetown students who created the “fast-casual dining” concept have high expectations for “the coolest sweetgreen yet!” In just a few months, they’re making it easier than ever for us to get our daily dosage of their all-natural salads and frozen yogurts. Now all we need is an organized walkathon between the four stores. Load up on veggies and yogurt. Walk to the next one. Repeat. Unless we can catch a ride with that truck?